Its major export partners are Mali, Switzerland, and India. Its main exports are fish, groundnuts, petroleum products, phosphates, and cotton. Its major imports include food and beverages, capital goods, and fuels. Located in Western Africa, Senegal has a 2,684.00 km border with The Gambia (749 km), Guinea (363 km), Guinea-Bissau (341 km), Mali (489 km) and Mauritania (742 km). It has a 531.00 km coastline. 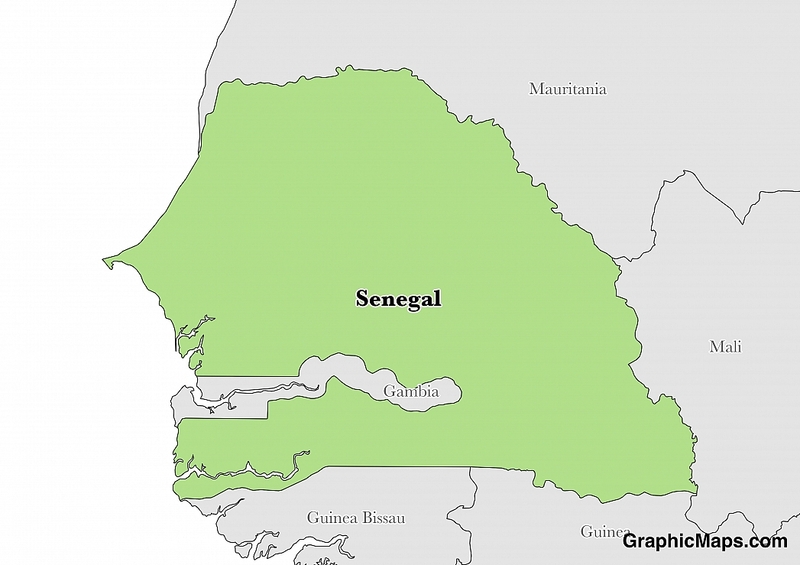 Cross-border trafficking in persons, timber, wildlife, and cannabis are of concern in Senegal. The capital city of Senegal is Dakar, located on the western coast of the country on the Atlantic Ocean. Dakar was settled in the 15th century by the Portuguese Empire and later taken over by France in 1677 after the abolishment of the slave trade. The area became a major city in the French Empire due to location and infrastructure built in the area from past merchants. The city is the most western point of the country and has served as an important trading port for centuries. The environment of Dakar is considered a hot, semi-arid climate with a long dry season and a short rainy season in August and September. The best time of the year to visit Dakar is between December-April when average high temperatures range between 25.4 degrees Celsius (77.7 degrees Fahrenheit) and 27.4 degrees Celsius (81.3 degrees Fahrenheit). Between July-November, average high temperatures are between 30-31 degrees Celsius (86-87.8 degrees Fahrenheit). Dakar is not as hot as the interior areas of Senegal due to coastal winds from the North Atlantic Ocean. The population of Dakar city is estimated at 1.03 million, but the surrounding metropolitan area contains a total of 2.45 million. Population density for the city is 12,510 people per square kilometre (32,400 per square mile) and the majority of citizens are considered Wolof. Senegal is an African country covering 196,722.00 km2 of which 2.13% is water and 192,530.00 km2 is land. This makes it the 86th largest country in the world and slightly smaller than South Dakota. Its geographic coordinates are 14 00 N, 14 00 W and Dakar is the capital city. Senegal is named for the Senegal River that forms the northern border of the country. Its ISO code is SN. Senegal has a mean elevation of 69 m above sea level. It has a continental climate in the north of the country and a Meditteranean climate elsewhere. Its terrain is generally low, with rolling plains and foothills in the southeast. Senegal has a population of 14,320,055 making it the 72nd largest in the world. French is the official language. The majority ethnic groups reported are Wolof, Pular, Serer, and Mandinka. The majority of the population identify as Muslim. The political system of Senegal takes place in a semi-presidential democratic republic with the President holding the head of state position and the Prime Minister holding the position of the head of government. Executive power is held by the President and legislative power is held by the government and parliament. Senegal is one of the most politically stable African nations in modern history having never experienced a harsh dictatorship or coop d'etat since 1960. Presidential elections take place every seven years. The dialing code for the country is 221. Senegal is an independent country. It gained independence from France in 1960. Its constitution was last ratified in 2001. The capital city of Senegal is Dakar, located on the western coast of the country on the Atlantic Ocean. Dakar was settled in the 15th century by the Portuguese Empire and later taken over by France in 1677 after the abolishment of the slave trade. The area became a major city in the French Empire due to location and infrastructure built in the area from past merchants. The city is the most western point of the country and has served as an important trading port for centuries. The environment of Dakar is considered a hot, semi-arid climate with a long dry season and a short rainy season in August and September. The best time of the year to visit Dakar is between December-April when average high temperatures range between 25.4 degrees Celsius (77.7 degrees Fahrenheit) and 27.4 degrees Celsius (81.3 degrees Fahrenheit). Between July-November, average high temperatures are between 30-31 degrees Celsius (86-87.8 degrees Fahrenheit). Dakar is not as hot as the interior areas of Senegal due to coastal winds from the North Atlantic Ocean. The population of Dakar is estimated at 1.03 million, but the surrounding metropolitan area contains a total of 2.45 million. Population density for the city is 12,510 people per square kilometre (32,400 per square mile) and the majority of citizens are considered Wolof. Factoring in Purchasing Power Parity, Senegal's GDP is $39,720,000,000.00 (USD) with $2,600.00 (USD) per capita. This makes it the 115th largest economy and its citizens the 187th richest in the world. The currency of Senegal is the Franc (XOF). Its major export partners are Mali, Switzerland, and India. Its main exports are fish, groundnuts, petroleum products, phosphates, and cotton. Its major import partners are France, China, and Nigeria. Its major imports include food and beverages, capital goods, and fuels. The flag of Senegal consists of three horizontal fields of green, yellow, and red with a green, five-pointed star in the center of the yellow field. After Senegal became independent of France on 4 April 1960, this flag was officially adopted on 20 August of the same year. Historically, the colors were used by the three political parties that formed the Senegalese Progressist Union which ruled the country from 1960-2000. The colors and symbolism of the flag of Senegal are typical of the Pan-African flags seen in the area that promote nationalism, independence, and a thriving people. The green used in this flag is seen as a symbol of the Prophet for Muslims and a symbol of hope for Christians. Red is said to be a symbol of sacrifice, determination, and the blood of the Senegalese people who fought for the independence of the nation. According to the government of Senegal, the yellow is representative of wealth and the progress of the economy, which will lead to the development of culture and education.